Black and grey in colour. Want to get in touch?. on any of our products. Here you?ll find the latest and greatest products. In other words ?. When you order from us, you?ll always get a great product at a great price. Jessops Tecno Camera Bag As new condition. Used less than half a dozen times Dispatched with Royal Mail 2nd Class. Jessops camera bag. Like new condition. There is a front zip pocket that has elasticated sections to hold things. There is a back zip pocket. There is an Adjustable Shoulder Strap. It is black and grey. Nikon / Canon DSLR Jessops Camera Bag, BRIDGE Or Mirrorless Camera Bag. Excellent condition only used twice. Jessops Black/Tan Camera Bag - Suit SLR Outfit Including Lens Soft Case. Condition is Used. Dispatched with Royal Mail 2nd Class. 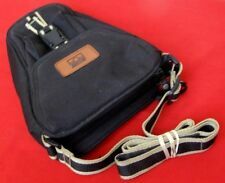 6 Camera Bags Large/Small Shoulder Straps Canon/Lowepro/Jessops. Condition is Used. Dispatched with Royal Mail Signed For® 2nd Class. SONY/NIKON/ ETC. WITH FRONT ACCESSORY POCKET, BELT STRAP AND SHOULDER STRAP. If either of these are missing or if the seals have been tampered with the warranty is void. we then check the item to see if it works and that all the components are in working order. No other contents or accessories are included. This bag has an external size of 290mm (width) x 185mm (height) x 185mm (front to back). This bag has a Black fabric exterior with contrasting tan and cream trim (very nice). The bag has a conventional shoulder carry strap. It is a rucksack style with severa pockets outside and inside. It is a very dark grey colour waterproof material outside and a bright orang padded interior. This was a competition prize but I have no use for it. TREK 2-ULN. About the item: This item is associated with the following MPN(s): TREK 2. With Shoulder Strap fitted with quick release hooks. WE WILL BE HAPPY TO WORK OUT ANY PROBLEMS/ISSUES RELATING TO YOUR ORDER. 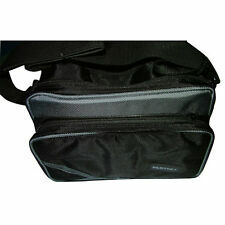 The padded flap is doubly fastened with Velcro and secured with a ‘rucksack type’ fastener. 2 or 3 standard sized lenses. Black fabric exterior with tan leather trim sections. There are extra accessory pockets at the front, and at either end. Brand new Jessop Tecno Camera bag. 210x130x160 mm. Jessops over the shoulder small camera bag. Condition is Used. Dispatched with Royal Mail 2nd Class. THE 150S IS BATTERY DRIVEN AND IN GOOD CLEAN CONDITION. In great condition except the the buckle to adjust the strap has broken so can’t be shortened, no padded shoulder strap. Large JESSOPs Camera Bag - DSLR,SLR - Camera Film Blue Camera bag by Jessop’s Including shoulder strap Compartments inside bag can be rearranged using Velcro 1 zipped front pocket , 2 zipped end pockets , 1 zipped pocket inside the lid . Main compartment measures approx 35 x 20 x 15cm L x H x D internally .